There was a glitch in our ticket system over the weekend and camping tickets were offline prior to the midnight discount expiration. So, we have decided to extend the deadline until the end of the day today, Monday June 26th. Call our office by 5pm today or order online by midnight to take advantage of extended early bird savings. 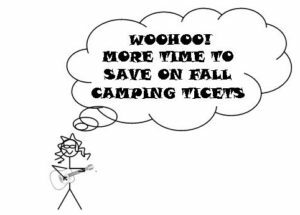 Tomorrow adult camping tickets will increase by $15 each, so we’re busy working to make sure your tickets to the Fall Festival are a deal at any of our price levels. Please call us if have any questions M-F, 9-5 at (209) 984-8630.